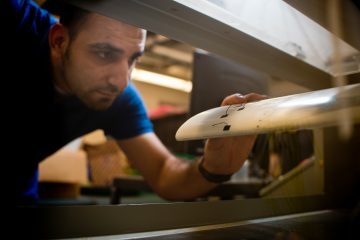 A UM-Flint mechanical engineering student utilizing a wind tunnel. The University of Michigan-Flint prides itself on its responsiveness to the ever-changing needs of communities, residents, and society. 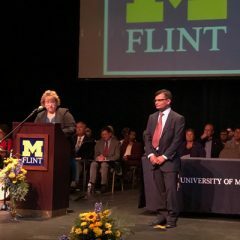 As part of the University of Michigan system, with deep roots in Flint and throughout mid-Michigan, UM-Flint is uniquely qualified to apply world-class resources and expertise to solving problems and improving lives locally and throughout the world. That commitment takes many forms. It includes efforts like that of the Department of Geography, Planning, and Environment to identify the locations of lead water pipes in the city of Flint. It includes connecting UM-Flint students across all disciplines with opportunities to serve and learn from organizations and businesses through internships and other partner relationships. It also includes the development of new academic degree programs that meet the demands and desires of society and students. The University of Michigan-Flint is enrolling students for the following new programs for the 2017-18 academic year beginning September 5th. UM-Flint now offers a Bachelor of Science in Respiratory Therapy (BSRT). 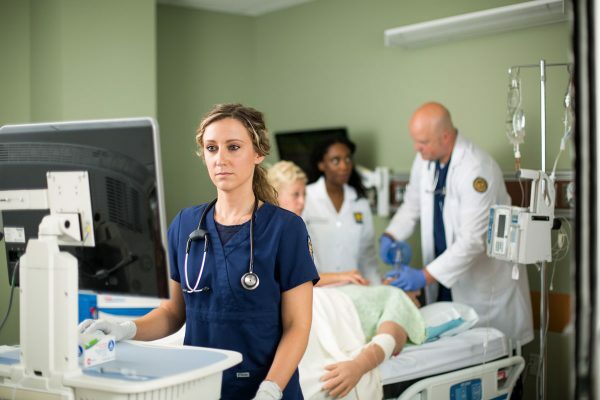 UM-Flint’s School of Health of Health Professions and Studies will begin offering an online degree completion program in Respiratory Therapy (BSRT). Part of the Department of Public Health & Health Sciences, the program is designed to provide a comprehensive education in advanced respiratory care for those with an associate degree in respiratory therapy from an accredited institution. Successful degree completion prepares students to sit for specialty credentialing exams administered by the National Board of Respiratory Care (NBRC). The School of Education and Human Services is launching a new major in Substance Use Treatment & Intervention (BS). 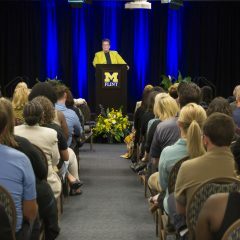 The program builds on the success of the Substance Abuse Treatment and Prevention minor, which has become one of the most popular minors at UM-Flint, attracting students from diverse academic disciplines including social work, criminal justice, psychology, business, education, and health care. That unending process has yielded the following new graduate degree programs. Mechanical engineering is the most diversified engineering discipline. That means careers in manufacturing, aerospace, power generation, automotive, energy, HVAC, and biomedical can all be enhanced through an advanced degree in mechanical engineering. Designed to meet the needs of working professionals, UM-Flint’s Master of Science in Engineering program features a full or part-time course schedule with on-campus classes offered in the evening. The globally recognized School of Management at the University of Michigan-Flint is excited about its new program, the Master of Science in Leadership and Organizational Dynamics. Courses will dive into managing change and diverse talent, negotiation and conflict resolution practices, and processes for improving organizational communication. The structure of the program blends online education with two weekend (Friday & Saturday) on-campus sessions per semester. 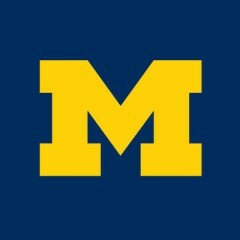 Offered through the world-renowned University of Michigan Rackham School of Graduate Studies, this unique dual program offers graduates the chance to earn a master of arts in liberal studies and a graduate certificate in business at the same time. The pairing aims to prepare individuals for leadership through engagement with liberal learning and the advanced problem-solving, decision-making, and management skills required for successful civic and work lives. 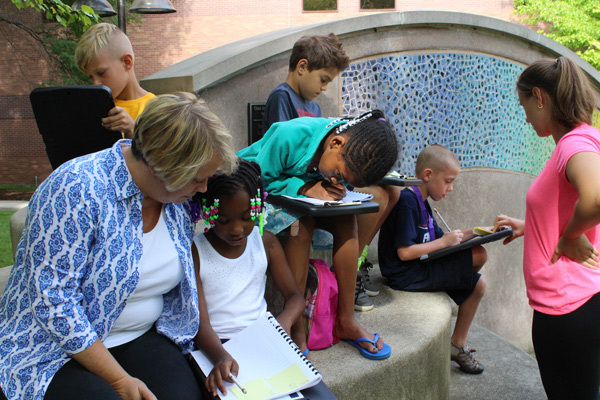 UM-Flint now offers a Master of Arts in Inclusive Education. UM-Flint’s School of Education and Human Services continues to advance its growing reputation as leader in the creation and implementation of innovative educational practices with its new Inclusive Education (MA) program. Its primary goal is to move proven research methods into practicing educators’ classrooms to create a truly inclusive environment. Additionally, the part-time, 100% online format gives teachers the convenience to attend while working. Teaching mathematics to younger students provides its own challenges and rewards. The UM-Flint faculty responsible for the design and administration of the new Mathematics Education for Elementary & Early Childhood Educators (MA) couldn’t wait till September to begin working with math educators; the program will begin in July. In addition to mathematical topics, the curriculum includes the study of learning trajectories and pedagogical best practices for teaching mathematics. Since the official establishment of UM-Flint’s School of Nursing in 2016 (it was previously a department), it continues to expand in both capacity and program offerings. Beginning this fall, it will offer a nursing certificate in Adult Gerontology Acute Care. The demand for acute care providers in the adult population is increasing at veterans’ medical centers, emergency departments, rehabilitation centers, skilled nursing facilities, and other settings. Beginning in the winter semester (starting January 3, 2018), the School of Nursing will offer a new MSN concentration designed to develop the next generation of nurse educators. In conjunction with faculty members from the School of Education and Human Services, nursing faculty assist students with obtaining practical teaching experience and knowledge in this specialty. Graduates will be qualified for faculty positions, staff nurse educator positions, and other teaching roles.